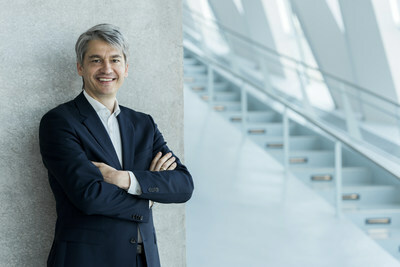 LAS VEGAS and STUTTGART, Germany, Jan. 10, 2019 /PRNewswire/ -- During the Consumer Electronics Show (CES) in Las Vegas, Benedikt Schell, Chief Experience Officer and Member of the Board of Management at Daimler Financial Services, demonstrated how Daimler AG and its portfolio of products and on-demand-services is able to help shape cities today through predictive mobility. For the first time, Daimler Financial Services offers insights into its global mobility ecosystem, which opens new business opportunities in the age of "mobility-on-demand." Within the last ten years, the company's Mobility Services division established a mobility ecosystem that is functioning as a one-stop-shop for cities and customers, using the smartphone as the catalyst to fit customers' mobility needs. "In the past, a city defined our mobility through rigid routes and products. But today, we are helping cities shape mobility. Customers make decisions on how to be mobile and our services and technology are their trusted companion on their mobility journey," stated Benedikt Schell, Chief Experience Officer and Member of the Board of Management at Daimler Financial Services. By creating a holistic ecosystem of mobility in urban areas, Daimler Financial Services is using data generated by the various mobility platforms and using complex, proprietary algorithms to better-predict mobility preferences with a high rate of accuracy. This applies to various times of the day, in any weather condition and anywhere within a city. Thanks to the advancement in data analytics, it is now possible to optimize availability. This means that each car in the company's car sharing fleet is located in close proximity to demand, and thus available to satisfy customer's needs. By incorporating public transportation into mobility services offerings, customers have a 360-degree perspective, which makes it attractive for cities to build their mobility infrastructure together with mobility partners like Daimler Financial Services. Based on the three successfully operating mobility services, car2go, mytaxi and moovel, Daimler Financial Services is able to provide a seamless customer journey today in more than 130 cities and 19 countries by understanding mobility trends. car2go launched in 2009 and offers all the advantages of a car — without the expense of owning one. Parking, gas and insurance are included and car2go is available 24/7. car2go is available in ten cities in North America, including Austin (TX), New York City (NY), Chicago (IL), Denver (CO), Portland, (OR), Montreal (CAN), Vancouver (CAN), among others. With a global fleet of 14,000 thousand vehicles, a car2go is rented every second. With its Mobility-as-a-Service (MaaS) platform, moovel offers cities and transit authorities a toolbox they can use to help integrate various mobility providers. One of the most important components is the mobility app allowing users to find, book and pay for public transportation tickets, as well as other mobility options such as car sharing, ride hailing, and rental bikes. In the U.S., moovel is the leading provider of mobile-ticketing apps for public transit. The mytaxi app was launched in 2010. mytaxi is part of Daimler's ride-hailing group which also includes beat, Clever Taxi and Chauffeur Privé. The ride-hailing revolution of mytaxi is based on a simple principle: order, pay and rate your taxi within one app. Today, more than ten million customers use this service around the globe. The U.S. is one of several top markets related to moblity services. Daimler Financial Services believes the potential for significant growth exists and is targeting its efforts to capitalize on those opportunities. Focus areas include creating a new ecosystem of mobility. Beyond platform and car sharing, the company has expanded its presence through a diverse mix of strategic mobility partnerships, such as: FlixMobility, which owns the FlixBus brand and is radically changing the customer experience in long-haul bus travel; the premier chauffeur service Blacklane; and Via, one of the leaders in dynamic, on-demand shared-ride technology. As automotive technology evolves, so too will the services to support autonomous fleets. From financing, logistics and maintenance to predictive analytics, Daimler Financial Services is looking at how its expertise in fleet management and subscription services can support Daimler's autonomous product strategy. Together with Bosch this year, the company will offer customers automated shuttle service on selected routes in San Jose, California. This pilot is expected to demonstrate how a stable of mobility services, such as car sharing (car2go), ride hailing (mytaxi) and multimodal platforms (moovel), can be intelligently combined to shape the future of mobility. "With the pilot in San Jose, we will test how predictive mobility can shape cities in the age of autonomous mobility. Smart management of autonomous fleets will be based on customers' needs," said Schell. "Mobility on demand, like car2go, moovel and Via, already today build the groundwork for future applications, including for autonomous vehicle usage." Daimler Financial Services today also announced that its mobility portfolio with car2go, moovel and mytaxi/Intelligent Apps* realized double-digit growth and benchmark results as of December 31, 2018. The company had 31 million customers. Compared to the previous year, this represents a 61% increase in the number of users of car2go, moovel and the ride-hailing group, which includes mytaxi, Beat, Clever Taxi and Chauffeur Privé. More than 186 million transactions were recorded in 130 cities worldwide last year. *Ride-Hailing Group: mytaxi and Intelligent Apps GmbH with beat, Clever Taxi and Chauffeur Privé. In the U.S., Daimler Financial Services' mobility portfolio, with car2go and moovel, serviced six million customers and generated 33.8 million transactions in 2018. This document contains forward-looking statements that reflect our current assessment of future events. Words such as 'anticipate', 'assume', 'believe', 'estimate', 'expect', 'intend', 'may/might', plan', 'project', 'are likely to' and similar expressions are used to identify such forward-looking statements. Such statements are subject to many risks and uncertainties. Examples include an adverse change in the global economic situation, in particular a decline in demand in our key sales markets, a worsening of the sovereign-debt crisis in the euro zone, an intensification of the budgetary situation in the USA, a deterioration in our funding opportunities in the credit and financial markets; events of force majeure including natural disasters, acts of terrorism, political unrest, industrial accidents and their effects on our sales, purchasing, production or financial services activities, changes in currency exchange rates; a shift in consumer preference towards smaller, lower margin vehicles, a possible lack of acceptance of our products or services which limits our ability to achieve prices as well as to adequately utilise our production capacities; price increases in fuel or raw materials; disruption of production due to shortages of materials, labour strikes or supplier insolvencies, a decline in resale prices of used vehicles, the effective implementation of cost-reduction and efficiency-optimisation measures; the business outlook of companies in which we hold a significant equity interest; the successful implementation of strategic cooperations and joint ventures; changes in laws, regulations and government policies, particularly those relating to vehicle emissions, fuel economy and safety; the conclusion of pending governmental investigations and the outcome of pending or threatened future legal proceedings and other risks and uncertainties, some of which we describe under the heading 'Risk Report' in the most recent Daimler Annual Report. If any of these risks and uncertainties materialise, or if the assumptions underlying any of our forward-looking statements prove incorrect, then our actual results may be materially different from those we express or imply by such statements. We do not intend or assume any obligation to update these forward-looking statements. Any forward-looking statement speaks only as of the date on which it is made. Daimler AG is one of the world's most successful automotive companies. With its Mercedes-Benz Cars, Daimler Trucks, Mercedes-Benz Vans, Daimler Buses, and Daimler Financial Services divisions, the Group is one of the leading global suppliers of premium cars and is the world's largest manufacturer of commercial vehicles. 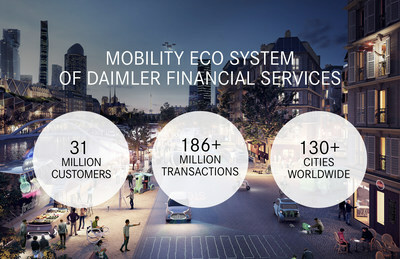 Daimler Financial Services offers financing, leasing, fleet management, insurance, investments and credit cards as well as innovative mobility services. The company founders, Gottlieb Daimler and Carl Benz, made history by inventing the automobile in 1886. As a pioneer of automotive engineering, Daimler sees shaping the future of mobility in a safe and sustainable way as both a motivation and obligation. The company's focus therefore remains on innovative and green technologies as well as on safe and superior vehicles that both captivate and inspire. Daimler continues to invest systematically in the development of efficient powertrains – from high-tech combustion engines and hybrid vehicles to all-electric powertrains with battery or fuel cell – with the goal of making locally emission-free driving possible in the long term. The company's efforts are also focused on the intelligent connectivity of its vehicles, autonomous driving and new mobility concepts. This is just one example of how Daimler willingly accepts the challenge of meeting its responsibility towards society and the environment. Daimler sells its vehicles and services in nearly every country of the world and has production facilities in Europe, North and South America, Asia and Africa. In addition to Mercedes-Benz, the world's most valuable premium automotive brand (source: Interbrand study, 4.10.2018), as well as Mercedes-AMG, Mercedes-Maybach and Mercedes me, the brands smart, EQ, Freightliner, Western Star, BharatBenz, FUSO, Setra and Thomas Built Buses and the Daimler Financial Services brands: Mercedes-Benz Bank, Mercedes-Benz Financial Services, Daimler Truck Financial, moovel, car2go and mytaxi. The company is listed on the Frankfurt and Stuttgart stock exchanges (ticker symbol DAI). In 2017, the Group had a workforce of more than 289,300 and sold around 3.3 million vehicles. The application of IFRS 15 and IFRS 9 in the 2017 financial year would have produced corporate sales of 164.2 bill. € and a corporate EBIT of 14.3 bill. €. Before the change to IFRS 15 and 9, corporate sales for the 2017 financial year as reported were 164.3 bill. € with a corporate EBIT for the 2017 financial year of 14.7 bill. €.